The assault weapons ban didn't work then. It's not going to work now. I will oppose it. .....and making me pay $200 and get my finger prints and say, I can't buy another one. Gun sales are UP and crime is DOWN. It's a false sense of security gun control advocates are pursuing here. And so our loop returns to the initial, unanswerable question why? These horrors happen in other countries too – Germany, Finland, even Britain – but they unquestionably happen more frequently in the United States than elsewhere. And they do so even when you control for the number of households which contain a gun (which is not quite the same measurement as guns per capita). So why? What is it about America that makes it different? For those on the other end of the political spectrum, this pathology in American identity is just as engrossing. Filmmaker Michael Moore's "Bowling For Columbine" pursues this question, and the film is all the more compelling (unlike many of his other films) for its uncertainty in finding a cause to American gun violence. On the conservative side the answer always lies in the sacred heritage of individualism, the wellspring of American culture. Massie takes this traditional line with an added twist that "variance coupled with individualism" has produced America as we know it, "a country of magnificent wonders and jaw-dropping failures. Its highs are very high and its lows exceptionally low. This, if you like, is a feature, cause and consequence of American exceptionalism." To drastically restrict these values is not only likely impossible, but undesirable: "the frontier – or the idea of it – must forever remain open. Because if it – or the idea of it – closes then a part of the American idea is also closed." Perhaps nothing will change because heartbreak and astonishment and outrage aren’t enough to uproot the deep ideological commitment Americans have to the image of the rugged individualist, the mythopoetic hero of a frontier never-land, the hero-loner. Perhaps, as a society, we are too beguiled by the illusion of that solitary figure’s place in our history to embrace collective action, to place our individual trust in the public institutions that we have built to protect our families and communities, to see beyond the mirage of a radical, “self-sufficient” past, and fortify the bonds of our complex civil society today. Perhaps we are living in the thrall of a yesterday that never was. 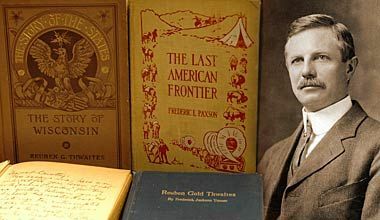 The frontier has been the concern of Americanists ever since Frederick Jackson Turner gave an address to the American Historical Association in 1893 called "The Significance of the Frontier in American History." Turner's purpose was, in essence, to sound the alarm over the disturbing revelation in the 1890 census that the western frontier was no longer in existence. With its disappearance went the defining force in the shaping of American identity. Thus American development has exhibited not merely advance along a single line, but a return to primitive conditions on a continually advancing frontier line, and a new development for that area. American social development has been continually beginning over again on the frontier. This perennial rebirth, this fluidity of American life, this expansion westward with its new opportunities, its continuous touch with the simplicity of primitive society, furnish the forces dominating American character. So long as free land exists, the opportunity for a competency exists, and economic power secures political power. But the democracy born of free land, strong in selfishness and individualism, intolerant of administrative experience and education, and pressing individual liberty beyond its proper bounds, has its dangers as well as its benefits. Individualism in America has allowed a laxity in regard to governmental affairs which has rendered possible the spoils system and all the manifest evils that follow from the lack of a highly developed civic spirit. In this connection may be noted also the influence of frontier conditions in permitting lax business honor, inflated paper currency and wild-cat banking. Nor did Turner neglect altogether the significance of Union and the individual acceptance of sacrifice, even sacrifice of cherished liberty, in the enterprise of civic belonging. Pioneer democracy has had to learn lessons by experience: the lesson that government on principles of free democracy can accomplish many things which the men of the middle of the nineteenth century did not realize were even possible. They have had to sacrifice something of their passion for individual unrestraint. In all these discussions of individualism, especially in the horrific response to Newtown by Wayne LaPierre and other NRA leaders, it is that notion of civic obligation that seems missing. Gun-control proponents have already made their sacrifice: we have given up our safety and the safety of the children around us. What, going forward, are gun-rights advocates willing to sacrifice?